In 1847, an Austrian obstetrician (Ignaz Semmelweis) figured out that hand washing in hospitals saves lives. On trying to persuade the medical profession of this fact, he came up against considerable resistance, with public ridicule and dismissal from his post at Vienna General Hospital. Nonetheless, in 1861 he went on to publish ‘The Aetiology, Concept and Prophylaxis of Childbed Fever’, and his legacy lives on today as the pioneer of hand hygiene in clinical practice. 150 years have passed since Semmelweis’ seminal work on hand hygiene, and the world today is much more accepting of his findings. It is widely agreed upon that hand hygiene helps in the prevention and control of communicable disease. Nowadays, all healthcare workers receive training about the importance of infection control measures such as hand washing. However, is it always practiced? In the UK, every hospital bed should have its own alcohol gel dispenser. Every bay in the ward should have a sink and alcohol gel dispenser within it. The entrance to every clinical area should also have hand gel dispensers. Despite such measures, hand washing does not always take place. Time pressures, emergencies and general forgetfulness are just some of the factors affecting hand washing. In Zambia, the challenges are greater still. A drawback of Nightingale style wards is that the distance from bed to sink can be far. 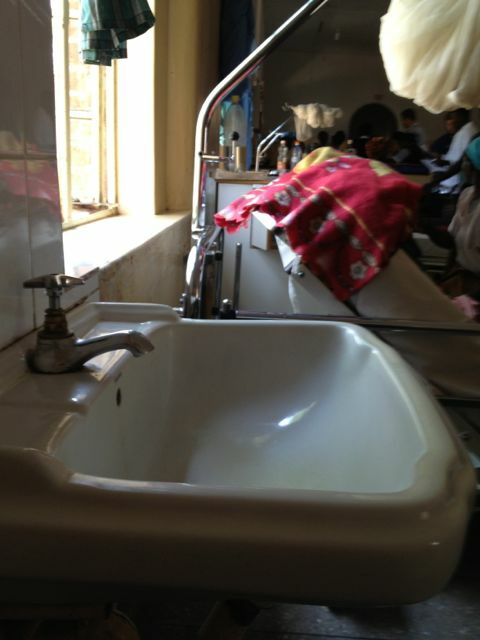 There are only two sinks on the female medical ward. Even if you do go to a sink, you may not find water. We are currently in the hottest part of the dry season, and on most days, we experience several hours without running water. Even if the tap is working, there may not be soap and almost certainly no paper towels. In a hospital that frequently runs out of essential stock items such as intravenous fluids, insulin and antibiotics, it is not surprising that alcohol gel is not available here. This means that when the water is off, unless a staff member has purchased their own alcohol gel, hands stay dirty. There is only one side room on each medical ward, so patients that should be isolated due to infective diarrhoea, TB, or meningitis are in bed next to cancer patients, diabetics and immunosuppressed HIV patients. We go from bed to bed, and so do the germs. One of the challenges I face is trying to bring about improvements without appearing critical or judgmental. Having only been in Zambia for 2 months, I am aware that I am a visitor here, and my observations may be both unwelcome and insulting. There is also little merit to me enforcing changes that I think should be implemented, because without local ownership of the changes, there is a high chance it would all revert back as soon as I leave. There is plenty of scope for apathy in this situation, but it has never been my style. Although I don’t want to end up shunned like Semmelweis’, I also don’t want to sit back and watch as E.coli, Mycobacterium tuberculosis and Isospora belli do their rounds alongside the clinicians. Any suggestions for tactful approaches? no excusses, just too busy being pensioners. It sounds an amzaing adventure for both you and Will, but more so for youself, as this is Will’s natural workplace. crew cut yet. Only joking. Your 4×4 looks enormous. I have to walk round your car at Mum’s house in Thorney, i don’t think it would go in there garage. At least you get a good view of everything being so high up. I think I would prefer something like the Nightingdale ward in the new Peterborough Hospital. No bays all private rooms like a private Hospital. I believe we have lost the important factor of community nurseing. The Braai looked great, all that nice weather. Will looked at home in his pinni doing the cooking. Quite unique having to Iron your underwear before you put in on. And finally that Safari must have been magic. We would have to pay thousands for something no where near as nice. Sorry to go on, must be an age thing. Will be intouch again soon. Wow, what a dilemma! It’s unimaginable to think that water isn’t always available, let alone soap, paper towels, and hand sanitizer. How would I clean my hands under those circumstances? Rub them briskly on a dry cloth? Might get off some dirt, but not germs. If it’s available, pour rubbing alcohol on them and rub briskly, then dry them by waving back and forth until dry. The only other thing I can think of (which you’ve probably already thought of yourself) … is there perhaps a charity or some such organization that could donate hand sanitizer? Or rubbing alcohol? If that could happen, then the nurses and other workers could be told that using the product would help keep patients from getting sicker and would also help themselves stay well. Or maybe they would simply follow your example. Good luck with the situation, which really made me think about how much we take for granted and how thankful I am for plain old running water and soap and clean towels … and hand sanitizer. When I used to teach Health and Hygiene, I showed a video where one person applied a substance which showed up under ultra violet light to their hands at the start of the day. At the end of the day, the people they had been in contact with were scanned to see how much of the substance had been transferred to them. Overall people were shocked by the results. Realise you do not have that technology but wondered if you could do something similar using chalk dust or even flower pollen. Just a thought. Hey Nat! If you look closely, a lot of the nurses and ESP students will clean their hands with the purple spirit between dirty procedures, before cannulas etc. might be worth chatting to the nursing tutors about what is taught about handhygiene to the nursing students-you might be pleasantly surprised, or find a route in if not? Ignaz Semmelweis was not an Austrian. With all the pressing health problems Zambia has including financial it’s not a surprise that hand washing and infection prevention would be at the bottom of the list, especially, as you stated they don’t even have enough of basic supplies. It doesn’t take a rocket scientist…..